Email the completed worksheet to Talitha by Friday, September 7. Email the completed worksheet to Talitha Matlin. Email the completed worksheet to Talitha Matlin (tmatlin@csusm.edu) by Friday, September 28. 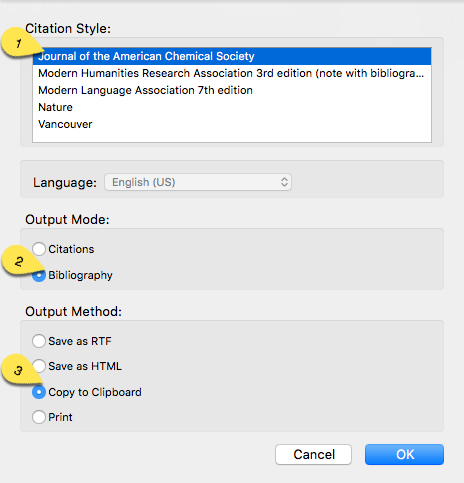 Select "Create Bibliography from Items"
Select the following options: "Journal of the American Chemical Society", Bibliography, and Copy to Clipboard. Double-check the citations against the examples on your ACS handout. Do the authors' names appear correctly? 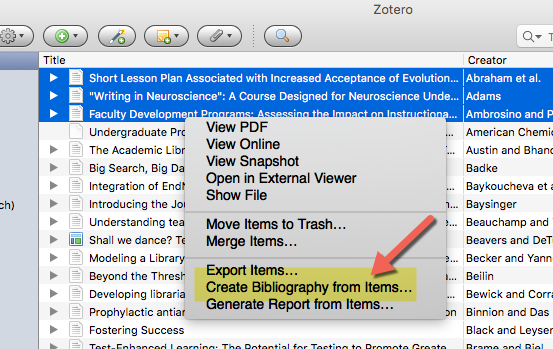 Is the journal title abbreviated? Is the formatting/punctuation correct? Email to Talitha Matlin (tmatlin@csusm.edu) by Friday, September 28. Email the completed assignment to Talitha by Friday, October 6.